Since defensive pincers are the most effective countermeasure against an enemy break-through, they should be applied whenever the tactical situation permits and the necessary forces are available. If these forces have sufficient striking power and mobility, the application of defensive pineers will reverse an unfavorable situation very quickly and decisively. The immediate objective is to seal off the enemy penetration by flank attacks launched simultaneously from both shoulders. Ideally, this maneuver should lead to a “Cannae” — the encirclement and destruction of the enemy force which has broken through. Another indispensable prerequisite for the success of defensive pincers is the close co-ordination of all participating units under one command. In minor actions the exercise of unified command will not meet with any particular difficulties. Complications arise during large-scale operations when some of the participating divisions are separated by long distances and belong to different armies or army groups. In such instances it is expedient to make a single army or army group command responsible for the entire operation. A similar procedure must be followed even in minor actions if the enemy at tempts to break through at a sector boundary — a common practice with the Russians. Defensive pincers can eliminate even comparatively major breakthroughs. 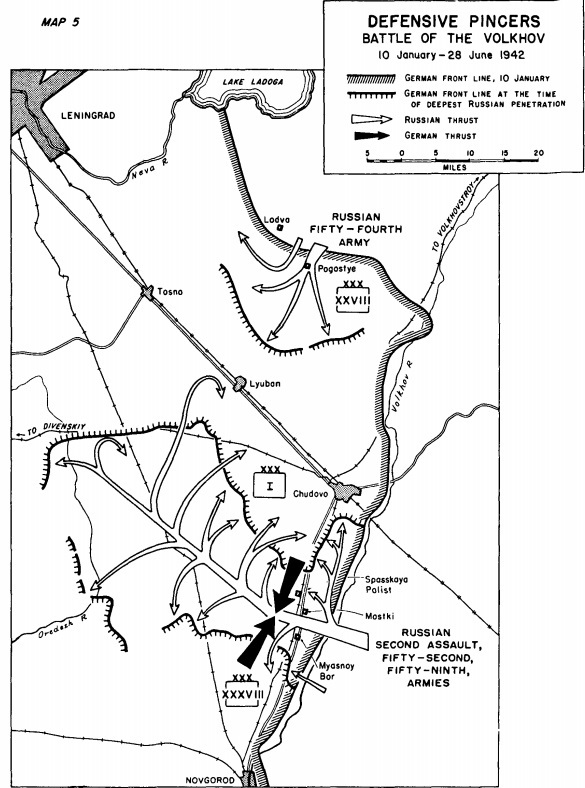 During the course of such an operation several divisions or corps may regain their freedom of maneuver as, for instance, after the Russian break-through near Belgorod in 1943. At that time the armored wedge which the enemy had driven to a depth of 100 miles was pinched off at the base of the penetration, and his thrust was checked by a pincers movement carried out by two panzer corps, start ing from the two opposite shoulders. When the jaws of the pincers are too weak or the terrain too difficult to tie off the enemy forces that have broken through, protracted fighting involving many critical situations and the formation of curiously shaped front lines will result.